LevelDB is becoming an interesting space in the Node.js community. Some healthy innovation is showing how a modular approach to building your own database has some compelling benefits. Don’t know what LevelDB is? Find out more here. Windows Azure Websites offers a fast and convenient way to get Node.js applications running quickly. It’s backed by a persistent disk which is replicated for you, so why not make use of that free space by putting your database on there? Here are some steps to getting LevelDB running in a Node.js application on Windows Azure Websites. 32 Bit version of Node.js. Visual Studio C++ 2010 (the free ‘express’ edition will do). Why 32 bit? Because node-gyp seems to target the processor architecture of the version of Node you have installed, and the shared (free) version of Windows Azure Websites is 32 bit only. This will also compile the native leveldown module. If you have any problems at this stage, I recommend cloning the leveldown repository, running `node-gyp configure`, and opening the .sln file located in the build directory. You’ll need to configure the solution to build Release mode. See the LevelUp documentation for more examples. Because Leveldown is a native module, you can’t compile it on Azure. Therefore you must add the compiled binary to your git repo. That’s straight forward enough, but you’ll find that you have 60MB of dependencies, which is quite a bit to upload to the Azure Website repo. It’s probably worth removing some of the unnecessary files before you add anything to git. You can remove everything from this folder, with the exception of the ‘leveldown.node’ file (which is the DLL we just compiled). That should bring you down to about 1.2MB. 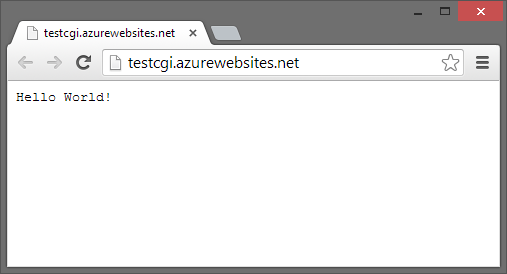 I found that large git pushes can take a very long time to Azure Websites. I think some throttling takes place after 4MB or so. You should also add the ‘db’ folder (or whatever you choose to name your database) to your .gitignore file, as you don’t want updates to your application to overwrite your database. You must keep the number of Node processes to exactly 1. You can scale up to a ‘shared’ or ‘standard’ model, but you can’t scale out. LevelDB cannot be hosted within multiple processes. LevelDB offers a fast and convenient way to host a database in an Azure Web Site. Websites run in a 32bit mode, I even found that the 63bit switch didn’t make any difference, but as long as we have the 32bit version of node installed we can compile the native module for this platform. It’s worth keeping your git repo small by pruning out some of the build artifacts. I did this by deleting the files, but you could do the same with a .gitignore file. You should keep your database files out of the repository using .gitignore. You should be careful about the number of Node processes you have running, given the constraints of LevelDB. It would be interesting to benchmark this against table storage to see if there any performance gains, perhaps another bog post? I wanted to run an async function across a number of items, and I wanted to do this in parallel. This turned out to be quite a straightforward thing to do, once you know how. Let’s find out how, by trying out a few different approaches. This takes 11000ms to run. Although we’re using the funky async/await keywords here, we’re running the code in series, rather than parallel. 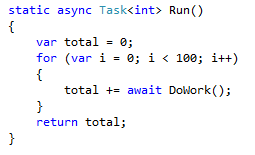 The ‘await’ keyword will block the execution of the loop until ‘DoWork’ returns. Let’s try to improve on this. Where is the first place to go for parallel execution in .NET, the Task Parallel Library right? This takes 65 ms to run. Looking good, we’re doing a Parallel For loop now, and we’re using an async lambda. Cool stuff. It also takes just 65ms to run, wow, that’s shorter than the 100ms delay on the task! Unfortunately the TPL doesn’t work well with async/await. 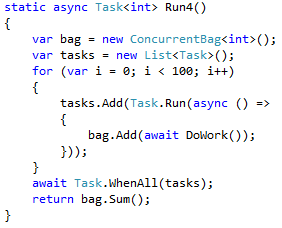 The For loop returns before the async tasks have completed. We never get the answer. This takes 45ms to run. Even though we’re using the Task.WhenAll, this doesn’t work either. 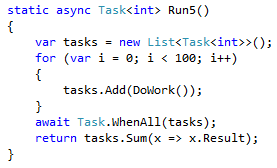 Task.Start doesn’t seem to be compatible with ‘WhenAll’ when async tasks are used. At least it’s faster than the last approach that didn’t work. This takes 180ms to run. Instead of starting the task, we use Task.Run to create and start the task. This now seems to work, and we’re in business. So what’s wrong? Well it turns out that Task.Run dispatches the code to run on the thread pool rathern than the current thread. This isn’t what I want. There’s also a lot of code here, and it doesn’t look very elegant. This takes 160ms to run. When you see the answer it seems obvious, you don’t use await in the loop, you just add all the tasks (promises) to a list, and await the lot when you’ve finished creating them. 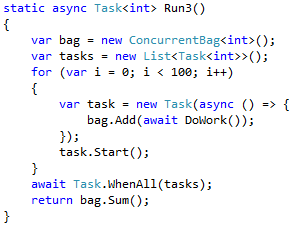 Async/await makes code look clean, but the async/parallel/task story in .NET is not a clear one. The parts don’t work together like you’d expect. You’re never quite sure where your task is going to run, on the thread pool or on the current thread? Thorough testing of async code is necessary. When awaits are short the await command will return immediately, which means that in real life the scenarios that didn’t work (i.e. attempts #2 & #3) will work correctly. This leads to some weird bugs and race conditions. A Service Management Service was recently added to the Node SDK for Windows Azure. This allows you to interact with the Azure management API, to create, deleted and manage Virtual Machines in Azure. To get started you need to get your management certificates in order. This is probably most easily achieved by creating new ones. The mycert.cer file can be uploaded to the Management Portal. The other files we’ll use in our node app. It’s a bit ugly in places. For disks you have to specify the Lun (the logical number of the disk, between 0-15) when you mount it. This number is not reported to you when you query the machine, and there’s no way of unmounting the disk without specify the Lun, so it’s something you have to keep track of yourself. Disks are also reported as being mounted on the deployment of a role, but you have request a mount/unmount on the instance. This is a bit confusing and inconsistent. One of the most important feature of any cloud is it’s programmability. Getting the SDK for this right is very important, and it’s surprising that this area isn’t mature. You can do just about everything through PowerShell and the cross-platform tools, but raw programmability is important too. This SDK is not finished, it’s not documented, and it’s a bit ugly in places. However, it’s a great start. It’s interesting to see Microsoft making this functionality available for Node.js before .NET languages. We know that the cross-platform tools are Node, so it’s obvious why, it’s just an interesting position to be in. Ok, there is a sample in C# (the Microsoft.Samples.WindowsAzure.ServiceManagement namespace) but it’s undocumented, unsupported, and not straight forward to use. Richard Conway’s Fluent Management library is good, but not complete (I’m sure Richard would appreciate help!). The only other viable option seems to be Python. I was wondering if you could manage to do the same with the php sdk ?? I been reading the docs and the source code but I can’t find anything related to virtual machines, I need to have a way to build a site where I can manage my virtual machines , is the nodejs sdk the only way to go besides the restuf api?